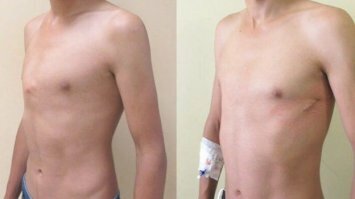 A Welsh hospital has become the first in the UK to offer a pioneering new treatment for patients with chest deformities. The first procedure at Cardiff's University Hospital of Wales was watched by specialists from a theatre gallery and over a video link. A specially designed metal brace is inserted through two small incisions in the side of the chest to reshape it. The operation helps people with pectus carinatum, known as pigeon chest.